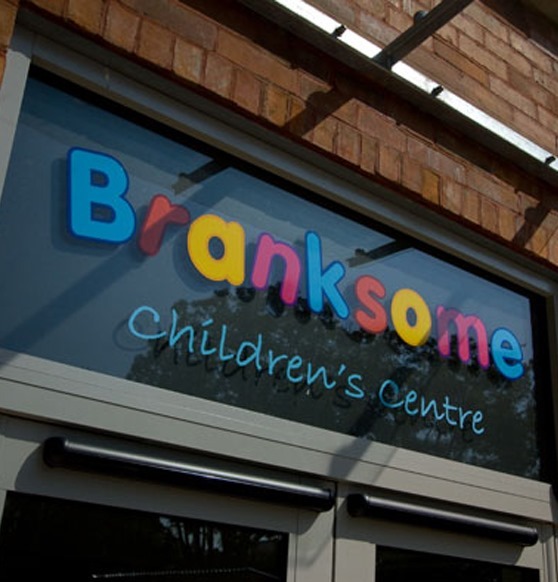 Branksome Children’s Centre is a nursery in Poole, Dorset. The centre takes care of children aged 0 to 5, and so their outdoor space had to be suitable for babies and toddlers, as well as for slightly older children who were ready to start school. BCC approached TimberTech because they wanted to spruce up their space by adding an attractive decked area to the nursery’s grounds. Since this outdoor space would be primarily used by very small children, safety and hygiene were big concerns. 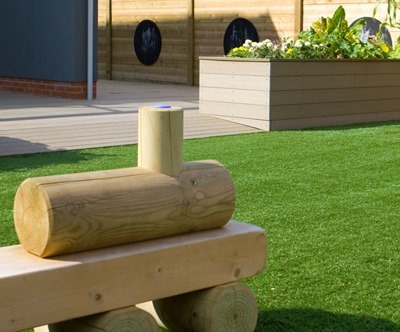 In this respect, TimberTech’s composite deck boards were ideal for the job; our slip-resistant decking minimises the risk of a nasty accident during playtime and outside learning sessions, and clean composite wood makes for a very safe play area. After a thorough look at the products on offer, the managers of the children’s centre in Poole decided that our VertiGrain 2 boards would be ideal for their decking project. The light wood colour is very attractive indeed, and it was decided that the VertiGrain 2 decking would serve to create a bright, appealing outdoor area for the children to enjoy. 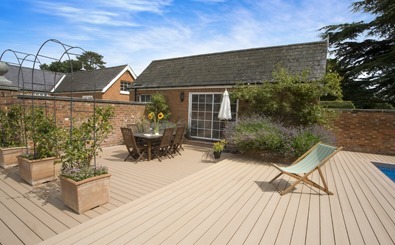 The decking was installed by local joiner in Poole. 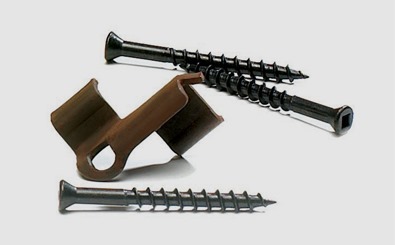 For a stylish, seamless effect, we included a set of colour-matched fixings; this facet of the design meant that the essential screws and fittings were practically invisible in the finished project. Of course, safety and appearances are all very important for adults, but this space was mainly intended for children, which meant that it had to be fun as well! The final deck design included a pair of planters that would encourage the kids to grow flowers and learn about plants and nature. The design also included a built-in trap made from the decking to ensure that essential services could be easily reached by tradesmen, but kept safe from the children. These features were built into the deck itself, and as you can see in our photographs of the Poole project, they really look the part! We at TimberTech are very pleased with the end result of our Poole nursery decking project. 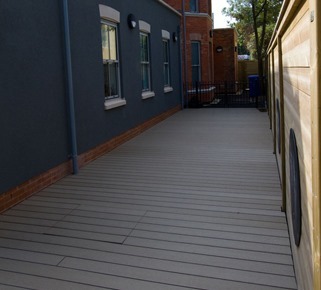 The deck looks an absolute treat, and it works very well with several aspects of the building itself. Some of the decking is sheltered by a canopy, allowing the children to play and learn outside even when the weather is grim. Also, the nursery’s bi-fold doors help to create a smooth transition between indoors and outdoors, which is very attractive from a design perspective. If the story of our Poole decking project has inspired you to explore decking options for your own outdoor space, we’d love to hear from you! 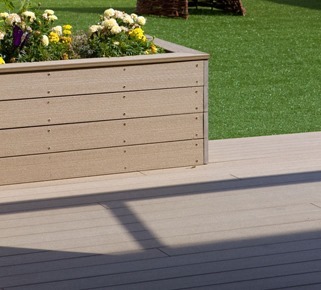 Whether you need decking materials for a commercial project or for a private residence, please call 029 2080 3756 or email commercial@timbertechuk.co.uk today.